The Sagaform Carafe is a versatile container without handles used for serving wine, water and other drinks. Featuring a wider base and narrow neck, the carafe is a classic Swedish design that will add a touch of elegance to your table. 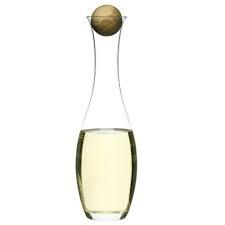 The bottle allows you to pour wine easily and freely to maximise the flavour and the spherical oak stopper keeps your favourite drinks fresh. Complete with a gift box, the carafe is an ideal present for the wine enthusiast. Hand Blown glass with solid oak stopper.